(CNN) -- FOTA has blamed world motorsport's governing body the FIA after the teams' representatives walked out of a meeting, claiming the future of Formula One was once again "in jeopardy." 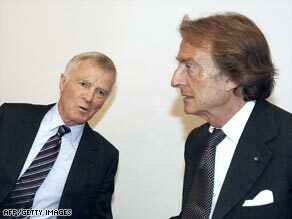 FIA president Max Mosley, left, and FOTA boss Luca Cordero di Montezemolo are battling over the future of F1. The Formula One Teams Association, which represents eight racing outfits, issued a statement explaining its new grievance with the FIA. It said its team managers attended the Sporting Working Group at the Nurburgring in Germany on Wednesday, having resolved its differences with the FIA over the future of the world's premier motorsport at crunch talks in Paris last month. However, the FOTA representatives were infuriated when the FIA's Charlie Whiting told them their teams were not officially entered into next year's world championship and had no voting rights at the meeting, where technical and sporting regulations were to be determined. The Formula One furor explained. FOTA said in a statement on its Web site: "It will be remembered that all eight active FOTA members were included on the 'accepted' entry list as endorsed by the FIA World Motor Sport Council (WMSC) and communicated by FIA press statement on June 24. "In light of these claims, the FOTA representatives requested a postponement of today's meetings. This was rejected on the grounds that no new Concorde Agreement would be permitted before a unanimous approval of the 2010 regulations was achieved. "At no point in the Paris discussions was any requirement for unanimous agreement on regulations change expressed. To subsequently go against the will of the WMSC and the detail of the Paris agreement puts the future of Formula 1 in jeopardy." The FIA released its own statement after Wednesday's meeting, but made no mention of the FOTA teams -- Ferrari, McLaren, BMW Sauber, Renault, Toyota, Red Bull Racing, Toro Rosso and Brawn GP -- being unable to vote on changes. "Following the decision of the World Council on June 24 to revert to the pre-April 29 version of the 2010 F1 Sporting and Technical Regulations, the FIA today met the teams which have entered the 2010 Championship to seek their agreement to these changes," it said. "All changes have now been agreed subject only to the maintenance of the minimum weight at 620kg and the signing of a legally binding agreement between all the teams competing in 2010 to reduce costs to the level of the early 1990s within two years, as promised by the FOTA representative in Paris on June 24. "The eight FOTA teams were invited to attend the meeting to discuss their further proposals for 2010. Unfortunately no discussion was possible because FOTA walked out of the meeting." The latest conflict between the two sides is perhaps not surprising given the antagonism that continued even after the Paris accord, which was supposed to resolve disagreements over budget limits. Ferrari president Luca Cordero di Montezemolo, who heads FOTA, immediately claimed victory over embattled FIA boss Max Mosley -- who responded by threatening to seek a fifth four-year term despite having agreed to stand aside as part of the deal. The row has erupted again ahead of this weekend's German Grand Prix, with Brawn's Jenson Button seeking to build on his 23-point lead over second-placed team-mate Rubens Barrichello. Red Bull's Sebastian Vettel, who won the last race in Britain two weeks ago, will be seeking victory on home soil to keep his title hopes alive.